The growth of electronics used in everyday items has created significant hurdles for many enterprises, especially with regards to allowing all the necessary people to see and analyse the electronic design data. 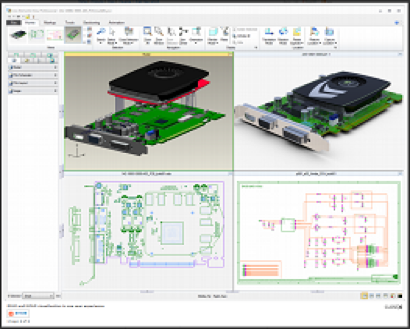 Creo View ECAD allows you to visualise all PCB-related designs with ease, whether in isolation or as part of the overall product and enhance product design collaboration. Creo View ECAD is able to utilise PCB data from all major EDA tools. Additionally, it can support drawings, images and documentation from a variety of sources, without needing access to the native authoring application. As Creo View ECAD and Creo View MCAD both leverage the same structure, it is possible for users of both apps to access unique features, for example cross-probing between ECAD/MCAD abstractions to enhance product design collaboration. Complex information can be accesses with ease, to improve decision analysis and also decrease the need for reworking. It is possible for all who work in engineering functions of a company to collaborate on a design- both in real-time and also through mark-ups.